Deer Management Program notification: The white trail is closed from Monday through Saturday (Open on Sunday’s Only) from the second week of September through the third week in February. We consider deer management to be absolutely critical to improving forest health and meeting our stewardship obligations. All other trails are open every day throughout the year. We appreciate your understanding. The Mount Rose Preserve includes 387 acres of meadows, shrubland, and forest that represents a wide diversity of native communities in the New Jersey Piedmont Region. The Preserve also contains the Honey Brook and Cleveland Brook, two important tributaries of the Stony Brook. Four miles of trails allow visitors to enjoy hiking, bicycling, bird-watching and similar outdoor activities. The Mount Rose Preserve, together with two office buildings on the east side of Carter Road, was opened in 1958 as the nation’s first corporate campus. It served as the major research and education facility for Western Electric, and later AT&T. The corporate education facility located on the west side of Carter Road was torn down in 2016. Forest Trail – From early successional forest dominated by eastern red cedar, to mature mixed hardwood and stands of majestic American beech, this 2-mile loop trail traverses the diverse forest types of the Mount Rose Preserve. Along the trail visitors can learn about the ongoing forest restoration project. Meadow Trail – This gentle 0.4-mile trail winds its way through meadows and shrubland habitat near the parking lot. This trail is a great place for bird-watching during the breeding and migration seasons. Lawrence Hopewell Trail (LHT) – 0.4 miles of this regional multi-use trail has been completed on the west side of Carter Road. An additional section of 1 mile is currently blazed on the east side of Carter Road, but is unimproved and open only to pedestrian use. This trail will be improved and made part of the LHT in the near future. A 0.2-mile trail from the parking lot kiosk provides access to the LHT. 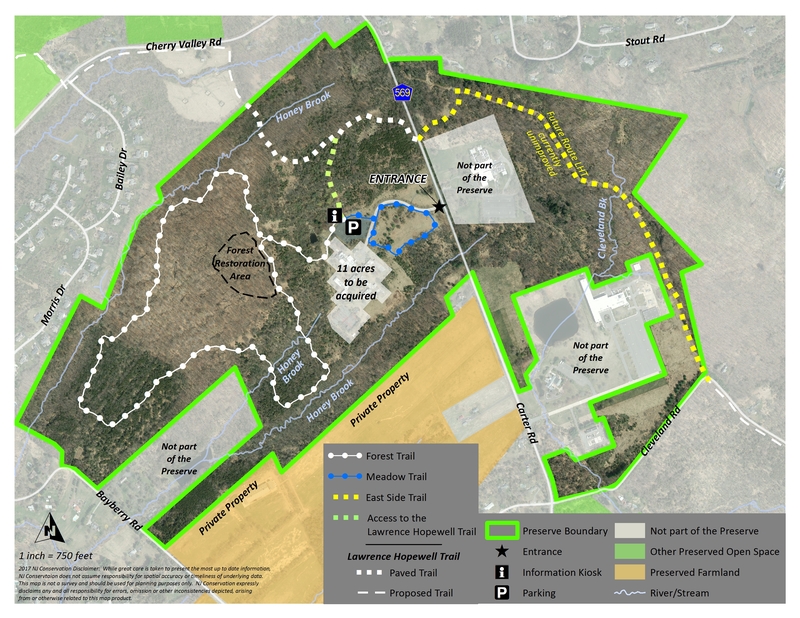 Mount Rose Preserve is owned and managed by New Jersey Conservation Foundation, Friends of Hopewell Valley Open Space, Hopewell Township, and Mercer County. It was preserved by these partners along with Hopewell Valley Citizens Group Inc., NJ Green Acres Program, Stony Brook-Millstone Watershed Association, Hopewell Borough, Pennington Borough, Friends of Princeton Open Space, D&R Greenway Land Trust, Lawrence Township and Princeton.